NYAPRS Note: A central image in the campaign to win enactment in New York of the Humane Alternatives To Long-Term (HALT) Solitary Confinement Act (A.3080-B / S.4784-A) is the replica of a solitary confinement cell (the ‘Box’) that was constructed by Doug Van Zandt and Alicia Barraza as a powerful demonstration of the place of torture that currently houses 900 individuals with mental health conditions in NYS prisons…and the site where their son Benjamin completed suicide in 2014. 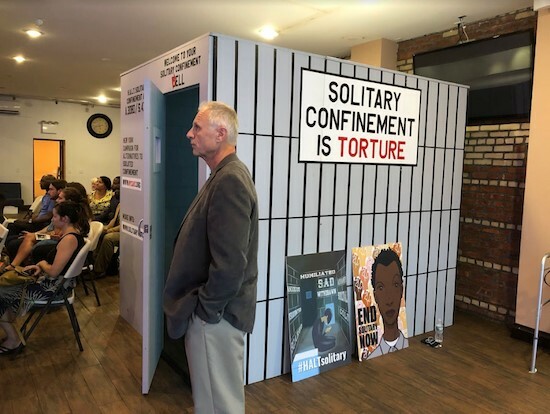 Previous to Colorado’s banning the use of solitary confinement, Colorado Department of Corrections head Rick Raemisch spent a night in the Box, which he in the Times at https://www.nytimes.com/2014/02/21/opinion/my-night-in-solitary.html. Similarly, NY Corrections Anthony Annuci agreed this week to do the same. See photos of the replica and of Dan and Alicia below and hear their powerful interview at https://youtu.be/WVYJxaXoDPQ. New York State's corrections chief would be willing to spend the night in solitary confinement, he told legislators today. "If this will advance the agenda, if we sit down and end up with legislation that we all think is prudent and in the best interest of New Yorkers, I'd be willing to do that," Anthony Annucci, acting commissioner of the Department of Corrections and Community Service, told Sen. Gustavo Rivera (D-Bronx) during a joint legislative committee hearing on public protection. It was not the first time the question has been posed to the commissioner, who oversees a system that has 47,152 inmates in its 54 facilities and supervises approximately 35,000 parolees. The last time Rivera asked, the commissioner laughed it off, saying "that would be the best night of sleep of my life." At today's hearing, when the question was repeated, Annucci sought to explain his remark. "I wasn't in any way trying to diminish or poke humor at this issue, it's a very serious issue. I was making fun of myself, because my phone rings at every hour of the night, and if I'm in a correctional facility ... I can't have a cell phone, I can't have a pager, no electronic devices," he said. State Sen. Betty Little (R-Queensbury) asked him if state prisons could be used to house prisoners from other states, following reports that prisoners from Vermont were being housed elsewhere because of overcrowding. "I believe — I'd have to double check with my counsel — it might be legally possible. Certainly if it's legally possible and it makes fiscal sense, we'd consider it, I guess," said Annucci. "If it's an idea worth pursuing, I think we could make it legislatively legally possible as well," Little replied.